In her San Francisco apartment in July 2009, Dr. Jane McGonigal, who wants to see a game developer nominated for the Nobel Peace Prize by 2032 - and who, if she proves right, is certain to be that nominee - hit her head on a cabinet door and suffered a concussion. For five miserable weeks, the noted designer of Alternate Reality Games (ARGs) like World Without Oil, The Lost Ring and Superstruct lived trapped in a mental fog; depressed and anxious at her slow improvement. Desperate to recover, she conceived a scheme. Because writing hurt too much, McGonigal commenced the project in a couple of grainy webcam videos. In them, she lacks the focused composure she showed in, for instance, her 2007-08 keynote speeches at O'Reilly ETech, the Serious Games Summit and South by Southwest Interactive. In the videos she looks completely unfocused and wild-haired, like a poleaxed barmaid. Focus, she explains, is the goal: "I'm one of those people who feels she should be working all the time, getting lots of things done - it's like part of my self-identity - so this has been really hard." The injury has restricted her workday to only two hours, she says, instead of her usual twelve to fourteen. Through twelve-hour workdays on many ARGs, Jane McGonigal had undertaken the task to erase the boundaries between games and reality. She advocated "fixing reality" by incorporating game-like structures into everyday life. Before the accident, she was preparing her most spectacular demonstration yet. With these in peril, and perhaps her career as well, she took control of her own recovery the only way that she knew - by making her recovery a game. McGonigal started designing games as a child in Moorestown, New Jersey, coding in Basic+ on a Commodore 64. In 1999, fresh out of Manhattan's Fordham University with a B.A. in English Literature and Media Studies, she worked at the dot-com StudentAdvantage, writing articles like "The Ice Cream Dating Method." Even then, 22-year-old McGonigal was praising the TV reality show Survivor for its emergent player-driven drama, meaningful play and satisfying outcomes. (She considers Survivor "still by far the most important show for game designers, and probably other kinds of social experience designers, to watch.") Later, she "puppet-mastered" The Go Game, a team-building "big game" scavenger hunt. She also organized some of San Francisco's earliest flashmobs, spontaneous gatherings for stunts, performances and massive games of tag and duck, duck, goose. These beginnings - Survivor-type challenges and large-scale gatherings - marked the themes of her career. We are concerned that as ubiquitous computers become more responsive to their users and environments, users are becoming less responsive to the environments in which our technologies are distributed or embedded. We support ambiguity, multiplicity and open-endedness in design, so that we perceive, rather than receive, our technologies. We believe that designers have a responsibility to encourage exploratory play. This led naturally to ARGs. 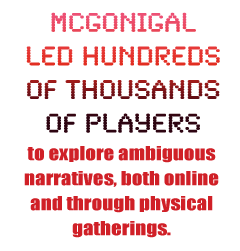 As 42 Entertainment's community director on ilovebees (2004), then as lead designer on Last Call Poker and Hex168 (both 2005), McGonigal led hundreds of thousands of players to explore ambiguous narratives, both online and through physical gatherings. Her 2003 paper "This Is Not a Game" (.PDF) and 2006 dissertation This Might Be a Game argue that games can promote community, revitalize public spaces and improve quality of life. She called it "Happiness Hacking."